A nonpolemical, engaging study of a once-thriving Indian nation of the American heartland whose origins and demise tell us much about ourselves. Along the Missouri River in North Dakota, the Mandan people flourished in the warming period between ice ages, circa A.D. 1000, drawn to the alluvial richness of the river as well as the bison hunting ranges of the Western grasslands. 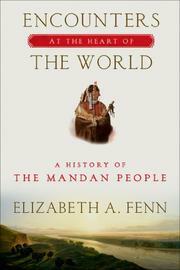 In her thorough mosaic of Mandan history and culture, Fenn (Western American History/Univ. of Colorado; Pox Americana: The Great Smallpox Epidemic of 1775–82, 2001, etc.) writes that these were an immensely adaptable people, migrating upstream when weather patterns changed, mastering the cultivation of corn and other edibles and the art of trade, often in competition with other horticulturalist tribes nearby, like the Arikara and Lakota. Elaborate Mandan defense fortifications indicated a vulnerability to attack, perhaps by the fierce, nomadic Sioux. Mandan homes were sturdy and numerous, solid earthen lodges built by the women, who also cultivated the fields, dried the meat and tanned the hides, revealing a strong maternal society where the husbands and the children were shared by sisters in one house due to the scarcity of men, perhaps due to mortality from war and hunting. At the time of the Spanish conquistadors, Fenn estimates there were 12,000 Mandans in the upper Missouri River; it was “teeming with people.” Gradually, contact with outsiders beginning in the 17th century and continuing with the famous interaction with Louis and Clark’s expedition up the Missouri in 1804 led to Mandan decimation by disease as well as by the Norwegian rat, which devoured their corn stored in cache pits. In addition to her comprehensive narrative, Fenn intersperses throughout the narrative many helpful maps and poignant drawings by George Catlin and others. An excellent contribution to the truth telling of the American Indian story.